LA CONTE (1998) The 77 foot wooden longline fishing vessel La Conte broke a plank in rough weather and sank January 30, 1998 approximately 60 nautical miles west of Cape Spencer. Two of the five crewmembers aboard lost their lives including captain Mark Morley (35) of Sitka and crewman Dave Hanlon (47) of Hoonah. William Mork, Mike DeCappa and Bob Doyle, all from Sitka, were rescued by U S Coast Guard Helicopter. Winds were reported to be 70 to 80 mph and seas 40 to 50 feet when the vessel, which was built in 1919 began taking on water. The La Conte did not have a life raft on board. LA FRANCE (1955) The 18 ton 35 foot wooden oil screw fishing vessel La France burned September 4, 1955 between Ketchikan and Moira Sound. LACLABELL (1912) The 12 ton 41 foot wooden gas screw Laclabell sank at 6:30 a.m. Wednesday June 13, 1912 a mile and a half west of Guard Island. Joseph Rose, master of the Laclabell states in the wreck report that planks opened up and the vessel sank very quickly. The conditions at the time were no wind, calm and daylight. The Laclabell was valued at $2,000 with no cargo and no insurance. LADY ANN (1965) The 13 ton 39 foot wooden oil screw fishing vessel Lady Ann was caught in the ice, destroyed and sunk January 3, 1965 near Ketchikan. LADY B (2001) The 17 ton 34 foot troller Lady B sank March 6, 2001 at the Petersburg Dock. Sometime later the remains of the vessel were towed to deep water and sunk. LADY LOUISE (1990) The 49 foot wooden salmon troller Lady Louise struck a rock and sank July 14, 1990 at Point Turbot. A private helicopter rescued the people on board. LADY NOREEN (1985) The wooden fish tender Lady Noreen was consumed by an electrical fire August 21, 1985 near Cape Chacon southwest of Ketchikan. LADY RAE (1948) The 12 ton 32 foot wooden gas screw fishing vessel Lady Rae was destroyed by fire May 14, 1948 at the southeast end of Woronkofski Island. The Lake Bay was valued at $3,500 with a cargo of only ballast and stores. She was not insured. The Lakewood was valued at $1,500 with no cargo and no insurance. LALOWA (1967) The 35 foot wooden gasoline powered fishing vessel Lalowa foundered April 17, 1967 at Pennock Island. LANG (1939) Ernest Nelson of Wrangell was the only one aboard when his boat, the Lang, stranded and was lost at “Passage Point, Fishwater Bay” in Chatham Strait at 5:00 p.m. Monday July 31, 1939. Nelson had departed Port Alexander July 29, 1939 bound for Sitka. The 7 ton wooden gas screw Lang was valued at $1,500 and had no insurance. Nelson attributes the accident to “carelessness on keeping course”. The conditions at the time were a “medium SE wind, moderately rough seas and cloudy”. Nelson was picked up by the vessel Nira. LANGLEY (1869) The 16 ton 45 foot American trading schooner Langley struck a rock in Chatham Strait near Deep Bay and became a total loss December 28, 1869. The vessel was on a trading expedition with owner and master Michael Sullivan and mate Barney Goldman aboard. The two were rescued January 21, 1870 by a steam launch from the U S S Cyane from the village of Kootznahoo where they had taken shelter. LARK (1965) The 47 foot wooden oil screw fishing vessel Lark burned December 29, 1965 at Point Baker. LASSIE (1959) The 21 ton 42 foot wooden oil screw fishing vessel Lassie foundered May 9, 1959 near Midway Island in Stephens Passage. LAURA (1924) The 8 ton wooden fishing vessel Laura stranded on “Walton Rocks, on Black Island” and became a total loss. Owner and master Ole Sivertsen of Seattle was the only one aboard when the casualty occurred. The vessel was carrying 4,000 lbs of fresh fish worth $80. The Laura was valued at $3,000 and was listed as a total loss with cargo. There was no insurance. Conditions at the time were “Wind, Gale, S.E., very dark, raining.” Cause of the wreck was said to be “Light on Black Island was out.” A small boat came to the assistance of Sivertsen. The Laura was valued at $2,000 and had no insurance. LAZARETTE (1972) The crab fishing vessel Lazarette flooded in rough weather and sank November 1, 1972 in Peril Strait north of Sitka. Two crewmembers were lost with the vessel. LEE WANG ZIN (1979) 30 Taiwanese crewmembers perished when the 741 foot Japanese ore ship Lee Wang Zin struck a reef and capsized December 25, 1979 in Dixon Entrance. The vessel later drifted ashore at Kendrick Bay on Prince of Wales Island. The Salvage Chief of Astoria, OR attempted to drag the vessel to deep water and scuttle her, but the tow line broke nine miles south of Forrester Island and the vessel plunged to the bottom in 1,000 feet of water. LEGASEA (1998) The 51 foot seiner Legasea broke her boom and capsized January 3, 1998 in the Eastern Channel near Sitka. The vessel made a set, pursed up and had a large catch of herring in her nets. The starboard boom stay broke as the crew was attempting to bring in a bag of fish causing the vessel to heel over. Skiff man Ron Painter (44) was stuck in the head and injured by the rigging of the Legasea as it rolled over. Skipper and owner Samuel P. Mutch (29) was thrown into the icy water from the back of the wheelhouse. J.P. Stelzer (20), Ryan Lindholm (20) and Bill Davidson (48) were able to stay on the dry side of the Legasea as she rolled over. Davidson was an area management biologist for the Alaska Department of Fish and Game and manager of the annual Sitka Sound sac roe herring fishery. All five men were able to escape alive and were rescued a mile southwest of Surf Rock by Sitka rescue personnel on the pleasure boat Angler’s Choice. The hulk of the seiner was later towed into Jamestown Bay for salvage. LEGEND (2011) The 58 foot wooden salmon fishing vessel Legend grounded, caught fire and was destroyed eight miles south of Ketchikan near Bostwick Point July 10, 2011. The Legend and her crew were on their way into Ketchikan with 5,000 pounds of freshly caught salmon on board when the helmsman fell asleep and the vessel ran aground. Attempts were made to refloat the Legend during which she rolled to starboard and caught fire. All five crewmembers escaped to a seine skiff and were rescued by Good Samaritan vessel Western Roamer. The Legend was a total loss. LELA MAY (1989) The fishing vessel Lela May sank June 18, 1989 off of Chilkat Island. All four crewmembers made it to safety. LENA F (1957) The 6 ton 29 foot wooden gas screw fishing vessel Lena F was consumed by fire November 26, 1957 at Wrangell. LEO (1888) The 155 ton wooden steam schooner Leo struck a rock and sank in Port Houghton Bay November 27, 1888. The vessel departed Seattle a month before laden with cargo for Alaskan ports. She was on her return voyage loaded with furs when heavy weather forced her to anchor in Frederick Sound. When the tide receded the Leo was left high and dry on a ledge of table rock and boulders. The damage done by a tide drop of 24 feet was severe and the crew was forced to abandon the ship as a total loss. The vessel’s gear was salvaged and five crewmen went with a boat to Juneau for assistance. The rest of the crew remained on the beach for 22 days until help arrived. The machinery aboard the Leo, which was salvaged, was from the old Portland steamer Wildwood. The Leo was refloated in February of 1889 using casks, taken to the cove on Japonski Island in Sitka Harbor and moored for the final time. The vessel served as a quarantine station for a time and later as a jail. The hulk of the Leo remained in the cove until WWII construction on Japonski Island covered the remaining exposed ribs of her hull. LETS GO (1991) The 71 foot trawler Let’s Go flooded and sank September 14, 1991 southwest of Sitka off of Cape Ommaney. All five crewmembers were rescued from a life raft. The Lewis McDonald was valued at $5,500 at the time of the foundering. The two aboard made it to safety. The vessel had no cargo and no insurance. The casualty report lists the loss to the Lewis McDonald as $1,100. The Coast Guard vessel Cyane assisted in the rescue of the crewmen of the Liahona. The vessel was valued at $20,000 with no cargo aboard. The loss to the vessel is noted as $4,000 in the report. LIBBY MCNEILL & LIBBY No 1 (1929) The 11 ton wooden scow Libby, McNeill & Libby No 1 foundered and sank in Dixons Entrance at 2:15 a.m. Saturday September 7, 1929. The vessel had just departed Kelp Island and was being towed by the tug North Star. They were bound for George Inlet with no persons or cargo aboard the No 1. Upon entering Dixon Entrance they encountered strong winds and heavy northwesterly weather and the scow, valued at $1,600 was lost. Source: U S Coast Guard Report of Casualty September 12, 1929 by F Svensson, General Supt. LIBBY MCNEILL & LIBBY IX NO 16 (1950) The 35 ton 60 foot wooden scow Libby McNeill & Libby IX No 16 was consumed by fire September 15, 1950 at George Inlet. LIBBY NO 9 (1974) The 60 foot fishing vessel Libby No 9 foundered July 23, 1974 in Veta Bay near Craig. Five of the six crewmembers were rescued by another fishing vessel. Lost with the Libby No 9 was Clyde Miyasharo of Wahiawa, Hawaii. LIBBY NO 12 (2002) The 43 foot dive boat Libby No 12 flooded and sank after striking a log May 19, 2002 approximately five miles west of Craig. The sole occupant of the vessel issued a May-Day and was rescued by the Craig Harbormaster who was first on scene. LIBERTY (1956) The 16 ton 39 foot wooden gas screw fishing vessel Liberty foundered September 11, 1956 off of the Barrier Islands. LIEF H (1965) The fishing vessel Lief H grounded on a shoal and sank November 16, 1965 in Wrangell Narrows near Channel Light 32A. Lost were owner Livingston Desmond and Newton Cooday. LILA KI (1968) The gas screw Lila Ki burned August 13, 1968 at Twin Points in Stephens Passage. LILLY (1928) The 10 ton wooden gas screw Lilly caught fire and was lost in Badger Bay at 8:00 a.m. February 29, 1928. The vessel departed Ketchikan February 23rd with two aboard bound for Boca De Quadra. According to owner operator Charles F Wilson, Captain George Steele of the gas screw Palmer S loaned him a hammer and cold chisel so he could cut the anchor cable and tow the hull of the Lilly to shore. The Lilly was valued at $6,500 before she burned. Lost in the disaster were Olaf Storfold, Gust Edwardsen, Carl H Carlson, S Birkeland, Ole Saterhaug, John Hansen, Oscar Torheim and Chris Solheim. The Limit was valued at $9,000 and had an unknown amount of freshly caught herring aboard. LINCOLN ROCK (1932) The 9 ton wooden gas screw Lincoln Rock caught fire and was destroyed while at anchor in Wrangell Harbor at 9:00 a.m. Saturday August 20, 1932. The five crewmen escaped the blaze and got ashore, but the Lincoln Rock, valued at $1,650, became a total loss. The vessel had no cargo and no insurance. Additional Information: Tonnage 9 Gross 8 Net, Built at Lake Bay 1915, Registered Wrangell, ON 213805, Master John McCullough of Wrangell, Owner Wrangell Packing Corp..
LINDA (1956) The 30 foot troller Linda swamped and sank July 30, 1956. A message in a bottle that was found a year later in the Gulf of Alaska off of Yakutat was the only testimony to the disaster. Lost was 16 year old Orville Rude who was taking his father’s vessel Linda from Elfin Cove to fish in North Inian Pass. LINDA E (1995) The 45 foot wooden fishing vessel Linda E struck a submerged object believed to be a log April 29, 1995 off of Point Howard, nine nautical miles northwest of Cape Decision. All four crewmembers donned survival suits and abandoned ship. They were rescued by the fishing vessel Connie Marie. LINNET (1929) The diesel fishing vessel Linnet was lost in Chatham Strait September 28, 1929. LIZZIE S SORENSON (1900) The 83 ton 84 foot wooden schooner Lizzie S Sorenson ran up on the reef at Killisnoo Monday March 12, 1900. The vessel departed Seattle and was “fishing off Alaska” with a crew of 15. Captain Frank Forward of Seattle was at the helm when “wind and rip tides” sent the vessel onto the rocks. According to the wreck report filed by owner John P Fay of Seattle, the Lizzie S Sorenson was worth $6,000 and her cargo of fish, salt and supplies for fishing worth $2,000. Fay further states the damage to the vessel was $6,000 and her cargo $2,000. The vessel was insured for $2,500 and her outfit and cargo for $1,500. The Lizzie S Sorenson was valued at $25,000 and became a total loss with no insurance. A wreck report was filed by William Walker, manager for Alaska for The Tyee Company of San Francisco. The Lois was valued at $12,000 with no cargo. The amount of insurance was not known at the time the casualty report was filed. LOIS M (1970) The oil screw Lois M stranded and was lost August 7, 1970 near Point Couverden. LOOMIS (1953) The 15 ton 45 foot wooden gas screw fishing vessel Loomis burned March 3, 1953 in Jamestown Bay, three miles south of Sitka. LORETTA C (1998) The 36 foot halibut longline fishing vessel Loretta C was consumed by fire from an oil stove March 27, 1998 in Petersburg Harbor. LORRAINE (1930) The 9 ton 36 foot gas screw Lorraine foundered in Saginaw Bay on the north coast of Kuiu Island February 18, 1930. The vessel was valued at $1,200 at the time of the tragedy. No one was aboard and no lives were lost. LOUIS G (1981) The seiner Louis G capsized and sank August 4, 1981 off of Cape Bartolome. All five crewmembers were rescued by the fishing vessel Delight. LOUISE (1977) The 10 ton 28 foot wooden gas screw fishing vessel Louise stranded and was lost October 12, 1977 in Bertha Bay. LOUISE II (1971) The seiner Louise II ran up on the rocks and broke up in rough weather November 17, 1971 on Clam Island between Klawock and Craig. All three crewmembers were rescued. 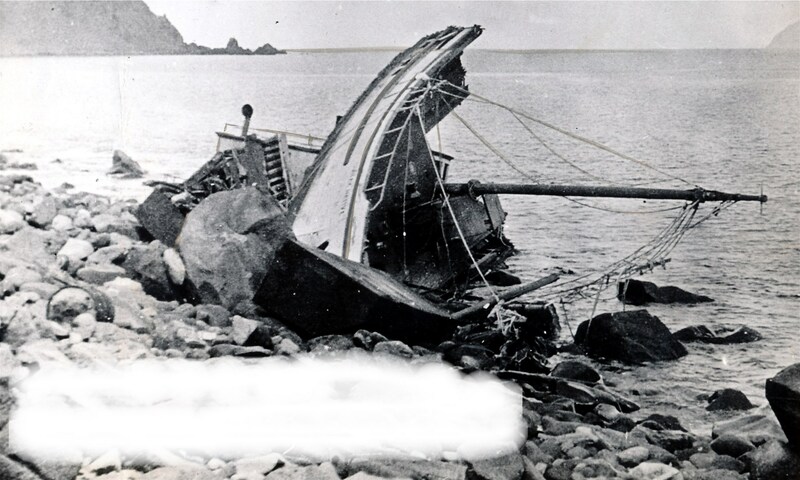 LOYAL (1954) The 11 ton 37 foot wooden gas screw fishing vessel Loyal was consumed by fire May 15, 1954 at Kimshan Cove. LU (1935) The 14 ton 38 foot wooden gas screw fishing vessel Lu foundered in Stephen’s Passage January 13, 1935. The 9 crewmen aboard made it to safety. LUCKY (1917) The 8 ton 33 foot gas screw fishing vessel Lucky foundered August 6, 1917 near Cape Fox. The three persons aboard made it to safety. LULA J (1977) The 11 ton 36 foot wooden oil screw fishing vessel Lula J foundered October 14, 1977 in Bertha Bay. The Lummi Bay was insured for $8,000. Her last port was Hidden Inlet that day.